Industrial spray painting is a highly specialised craft that requires special equipment and experienced professionals. At TLC Surface Treatment we provide spray painting services for the mining and technical industries that require paint protection for mass surface areas. Our Perth-based facility in Welshpool is fully-equipped to accommodate projects of all sizes that require various treatments. By using TLC Surface Treatment, you can rest assured knowing that your equipment is painted in a controlled and safe indoor environment thereby minimising contamination during the painting process, and allowing us to achieve superb, high-quality finishes, every time. Each piece of equipment and machinery that passes through our workshop is suitably prepared, primed, and painted to your specifications. This meticulous attention to detail ensures a top quality finish and extends the lifespan of your equipment. We use only the highest quality A-grade materials combined with meticulous workmanship, which guarantees you high-quality spray painting services. With TLC Surface Treatment you are guaranteed exceptional quality service. 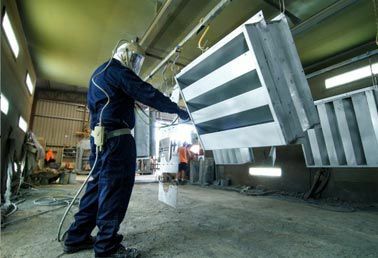 Our strict commitment to superior spray painting service is what Perth industries have come to know and trust. Give us a call for an obligation-free quote. Contact us and speak to one of our consultants about any of our services. We are happy to help. You may also submit an online enquiry and we will contact with you shortly. We look forward to hearing from you!